This Slow Cooker Vegan Chili features tri-color bell peppers and three kinds of beans, but the true star is the butternut squash. WARNING! 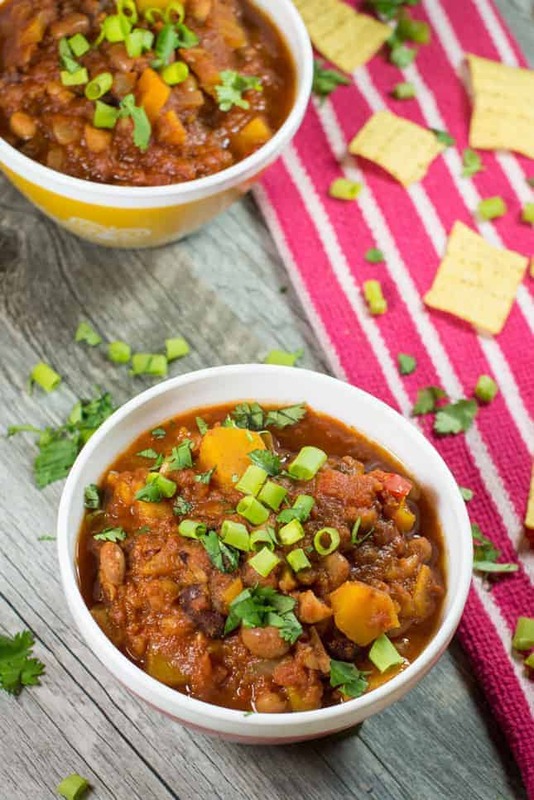 This Slow Cooker Vegan Chili is so good, you will not miss the meat! How do I know this? Weeeeeeell, a little birdie told me. OK, fine…it wasn’t a birdie; it was a man. And he wasn’t little; he was pretty tall. Not only do you not “need the meat,” but you also do not need cheese or sour cream. Yeah I said it. The cheese lover has spoken. Now if you’ll excuse me, I would like to get back to talking about this chili. This autumn favorite has a meaty texture, yet adds a sweet and subtle flavor to this dish. Combined with protein packed pinto, dark kidney and cannellini beans, you really won’t miss the meat in this chili. So back to the topic of cheese. Trust me. You don’t need it or the sour cream. The butternut squash adds the perfect amount of creaminess to this meal. Instead, top with fresh cilantro and scallions to complement the flavors found in this chili. This vegan and gluten-free slow cooker recipe is super easy to make! Start by adding beans, bell peppers, jalapeno, onion, garlic, butternut squash, crushed tomatoes and seasonings to your slow cooker. Then, stir to combine all ingredients, cover and cook on high for 4-6 hours. When you’re ready to enjoy, top with fresh cilantro and scallions and dig in! Add beans, bell peppers, jalapeno, onion, garlic, butternut squash, crushed tomatoes, chili powder, cumin, cayenne pepper and salt to your slow cooker and stir to combine. Serve topped with cilantro and scallions. I’m with Greg. Ditch the meat and bring on the butternut squash! Ohhh this look super delicious. Wouldn’t have ever thought that the secret ingredient in butternut squash ( I guessed it to be caulifliower! ).